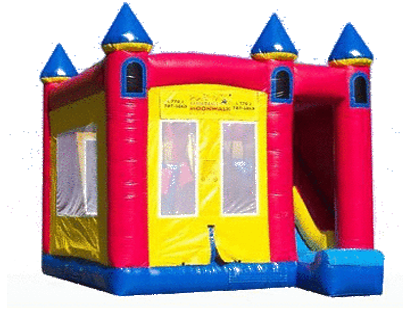 Combo Units You are on the combination inflatable rentals page. 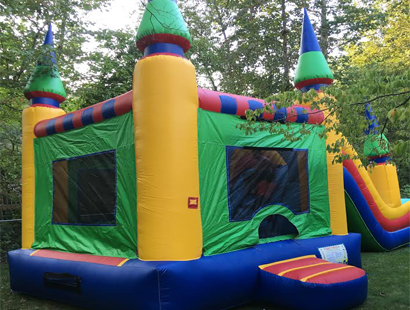 These units consist of multiple units in one, for instance, some of these units have a bounce house jumper unit and a slide or a bounce house jumper unit and climbing wall. If you feel this may be too much please check out our bounce houses from the menu above. 3 in 1 combo where kids can bounce - climb - slide. 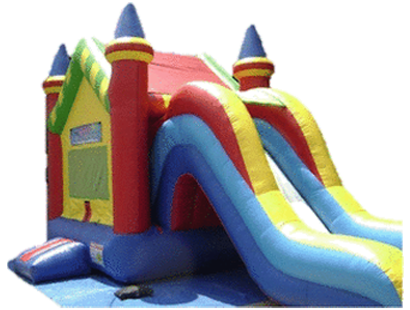 Your child will enter a 10' x 13' bounce area where they can jump high and long. To exit they will climb a 6' wall that leads to the double slide, which means double the fun. This bounce house has a castle theme with an extra lift. Kids can climb the interior stairs to the top of the 10’ slide which provides the exit from which they can run around to start over again. What a great place to play at your next fun event. This unit will keep the kids entertained and completely wear them out as they play on this multi-function. Inside this 3-in-1 unit they can bounce, climb and slide. The exciting colors and high spires make it attractive for any child. They’ll be drawn to it and play till time to come inside or their parents pick them up from the party. 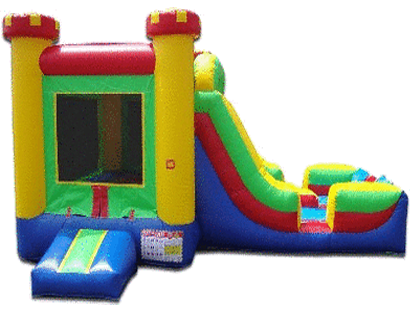 As kids enter they will access a large open bounce area with a basketball goal. Then, they can climb the staircase up to the 10’ slide. A quick exit from the slide brings them to a safe landing at the “stop” for the slide.